“In the foreground, several residential streets can be seen. Note that the streets are dirt with ditches at the side, and the sidewalks are wooden. In the middle of the photo, several houses are under construction. 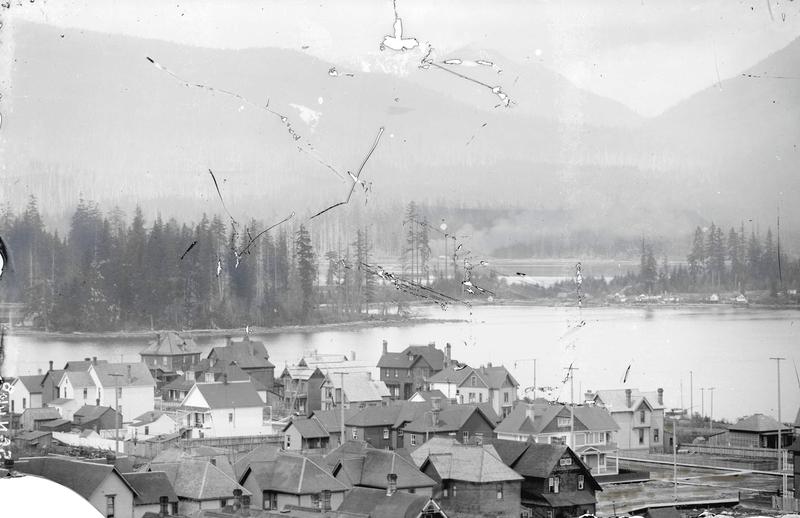 The railway tracks that ran along Vancouver’s waterfront are just barely visible on the right (east). Across the water on the left (west) is Deadman’s Island, still heavily timbered at this point. There is a single building on the left (west) side of the island. This may well be the smallpox hospital that opened in 1895. Behind that is what is now Stanley Park. The rightmost (eastern) portion had been logged in 1886, and there’s a small golf course just on the other side of Deadman’s Island (not visible). The buildings along the shorefront on the right are various shanties and cabins, possibly the remnants of the lumber camp located on that spot earlier. These were removed over the next few years. Either way, it’s a superb job. Click the picture above to enlarge it, and click here for the B&W original. Very nice! An impressive piece of historical reconstruction. However, the buildings on the foreshore of Brockton Point (west of the current position of the 9 o’clock gun) are those of so-called ‘squatters’ who settled the area prior to being forced out of the park. Their story may be of interest and can be found in Jean Barman (2005) Stanley Park’s Secret: the Forgotten Families of Whoi Whoi, Kanaka Ranch and Brockton Point. Harbour Publishing, Madeira Park, BC. Check the link to the Langara College archaeology field school above – we have been investigating the historical and pre-contact archaeology of Stanley Park for the last couple of years. Hi, can you please pass on the attribution for the photo?